Wa-Wa Sum is a Michigan State University research facility in Fisheries, Wildlife and Forestry studies located on the Au Sable River, six miles east of Grayling, Michigan. The name Wa-Wa-Sum means "Plain View" in the Chippewa Indian language and was given to the camp in 1905 by Chief David Shoppenagon, an Au Sable guide and outdoorsman. 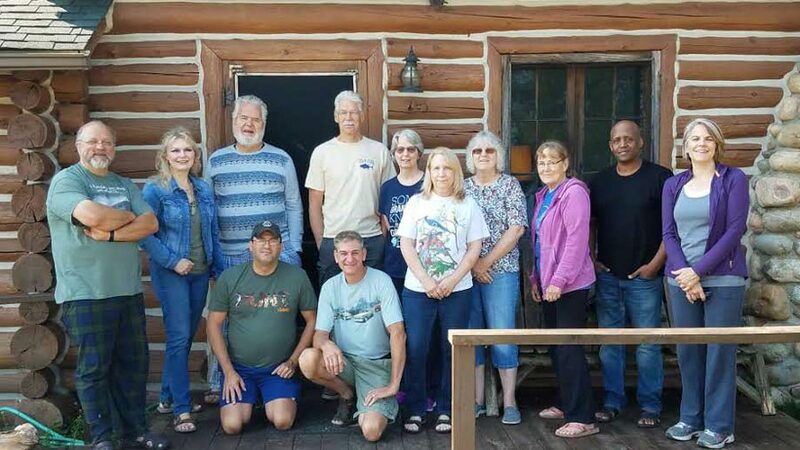 The first building was constructed of red pine and tamarack logs in 1897-98 by Rubin Babbit, an Au Sable woodsman who later become Michigan’s first wildlife officer. Currently, Wa-Wa-Sum is used as a natural resources research facility and as an education center. Forestry research focuses on the relative survival ability of several kinds of trees in the dry Grayling sand soil. It has been found that red pine does best under these conditions, and seedlings that die are replaced by this native tree. Fisheries research projects based at Wa-Wa-Sum are concerned with the population dynamics, habitat manipulations and management of inland fish resources. Bedrooms (three and four beds per room), each room has a sink,with a shared bathroom in the hall of each wing. The program is for beginners and professionals - and anyone in between. This is a very informal and relaxed workshop. The workshop will be limited to about 15 people, which makes for a better situation for individual learning and instruction. Our usual plans are open painting with one-on-one instruction. There will be group critiques and discussions as well. The workshop registration is Friday evening, usually by 7 or 8 p.m. The workshop will conclude at 1:00 p.m. the last day of the session. 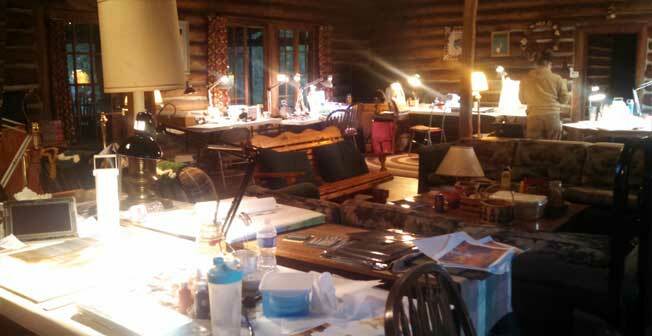 Accommodations: Workshop participants will be working and staying at Wa-Wa-Sum. As mentioned above, this is a very old and very rustic log facility. 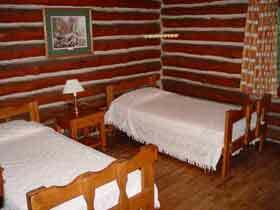 Bedrooms and bathrooms are located in the main lodge, in hallways off the side of the main work room. Rooms will be at least double occupancy, in some cases there may be three or four artists to a room. Due to limited space, I do not have accomodations for couples. You must bring your own sheets or sleeping bag, pillow or pillow case, and towels. (Ear plugs are optional!) The shared bath and shower are located in a separate room in each of the two hallways. Each room does have a sink and mirror. Meals are served in a separate kitchen building. Workshops are a great way to meet and share with other artists. They provide a time and place to concentrate on your art as well as a chance to get away and let your creative juices flow. Plan to make the weekend a mini-vacation. Stay with us at the camp, even if you are nearby, so you will not miss any of the programs and discussions. I encourage participants to bring any work for critique, finished or unfinished, wildlife, landscape, or other. I offer private critiques, but encourage participation in the group critiques. This is a good way to see your work and get everyone to become better acquainted through their art. The Workshop Package: Open painting anytime and individual instruction when needed. Three meals each day, except the last day which has breakfast and lunch. Snacks and refreshments will be readily available throughout the workshop. Hiking and free canoeing activities are also available. 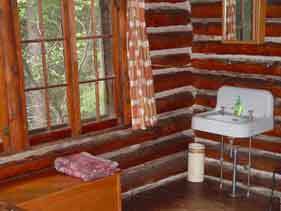 This is a rustic log cabin setting and it should be relaxed, casual and fun experience. Dress is extremely casual. There will be some outside walking between sleeping cabins, dinning rooms, and the work area. Prepare for all types of weather. The total cost for lodging, food, and instruction is listed on the newsletter and registration form. If you have any questions, please contact me. TO GUARANTEE YOUR SPOT IN THE 2019 FALL WORKSHOP - August 16 - 20 (2-day and 4-day seminars) register now. The workshop prices for 2019 are $280 for the 2-day session, or $500 for the 4-day session. Food, lodging & instruction included. TO REGISTER: click on the following link for a PDF registration form you can download and print. Registered Artists will receive more information and a detailed map approximately two weeks prior to the workshop. Please bring all the materials (brushes, paints, supports, etc.) that you wish to work with, or would normally work with. I do suggest that you also bring pencils, sketch paper, tracing paper (or transfer paper) and any reference material you are working with.